MySmsMantra offers SMS service including sms excel plug-in, voice calls, short codes, and long codes for businesses and organizations.. Toll-Free number is common & have proven effective for companies,especially for customer support & telemarketing. 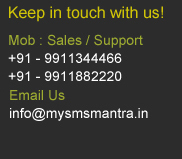 MySmsMantra.in Provides basic & customized Short code services in India, Send Sms through the Sms Short code. Virtual mobile number is to provide local and established image for you business.Includes sms sending, Voice calls, more. Are you ending up spending several hours attending to customer calls or making telephone call to customers for various business activities..
outsourced Marketing Services provide proper advertising and marketing experties for companies and individuals in India. Sms marketing is the most effective, reliable and cost effective way of marketing.